Rathlin Island is located off the East Coast of Northern Ireland, about 6 miles from Ballycastle. Its only £10.60 return for a standard adult fare (concessions available), with a choice of roll on /roll off ferry for those taking a vehicle, or a fast passenger ferry operating at alternate hourly periods. More details here. Unfortunately the faster ferry was taken out of service due to mechanical problems, so the 45 mins ro-ro service was all that remained for us...damn! At times the seas were a bit choppy, the worst bit of the sailing lasted about 15 mins and was over before u really noticed. It has 70 residents, a hotel, a couple of Bed and Breakfasts, and a few pubs. It has an RSPB bird sanctuary, is home to Puffins at certain times of the year and is well worth a visit. I stayed at The Manor House, (£65 for a twin room on a B&B basis) it is a lovely location, with sea views, a calm ambience, and a nice place to relax. On arrival we were asked if we would like to have lobster for dinner, it didn't take make much persuading...and the expectation overwhelming. At £25 it seemed a bargain. 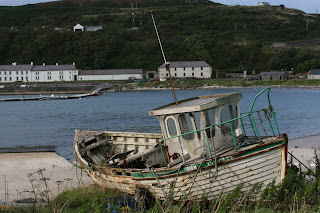 I will be visiting Rathlin again...hopefully the seas will be calm and the fast ferry operating.